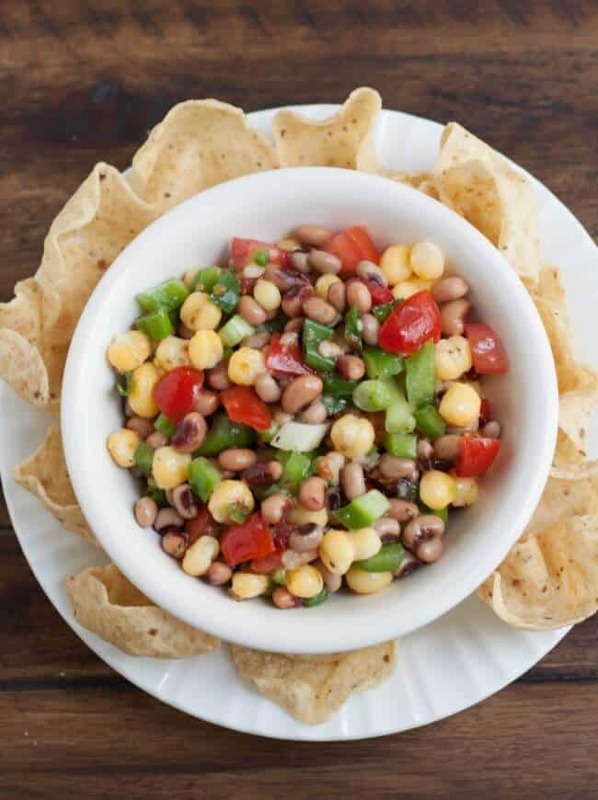 You’ll love how easy this Healthy Texas Caviar Salsa Dip comes together and the bonus is that it is good for you and so delicious too! 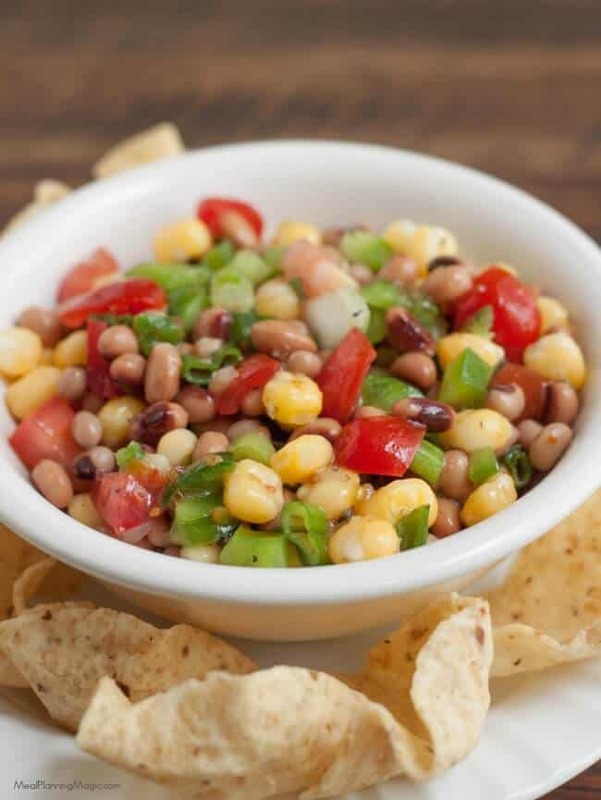 This Healthy Texas Caviar Salsa Dip is so versatile! You can use it as a dip with chips and watch how quickly it disappears. But it’s also great as a salsa on fajitas or tacos–chicken, beef, fish–you name it! I’ve even been known to just eat it by the spoonful for lunch. With all the veggies and black eyed peas, it’s a filling light lunch that I can feel good about eating because it’s not too heavy but a little goes a long way! I originally found this recipe from an old cookbook my sister-in-law gave me years ago. 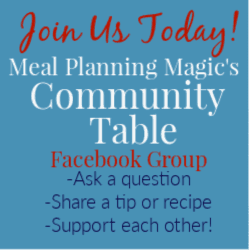 It’s one of those again that include family favorites and tried and true recipes. Texas Caviar is nothing new in my part of Texas (or maybe anywhere?) but the version I had had before was basically black eyed peas, a jar of salsa and maybe some green onions. I like this Healthy Texas Caviar Salsa Dip version because of all the fresh vegetables it includes. 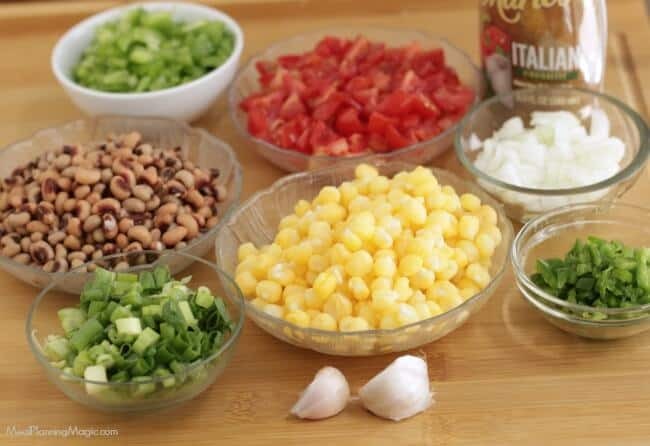 The original recipe calls for hominy which you find in the canned vegetable section of the store. To me, it’s kind of cross between a vegetable and a bean because of its texture. Dried hominy is often used to make grits! I’ve made this recipe with either hominy or frozen yellow corn and each way is delicious. Don’t be intimidated by the list of ingredients here! The chopped vegetables only take a few minutes to prepare and then it’s pretty much dump in a bowl and stir for everything else. I like to use the refrigerated Italian dressing that you find in the produce section of the grocery store because it has fewer preservatives than you find on the salad dressing aisle in the middle of the store. 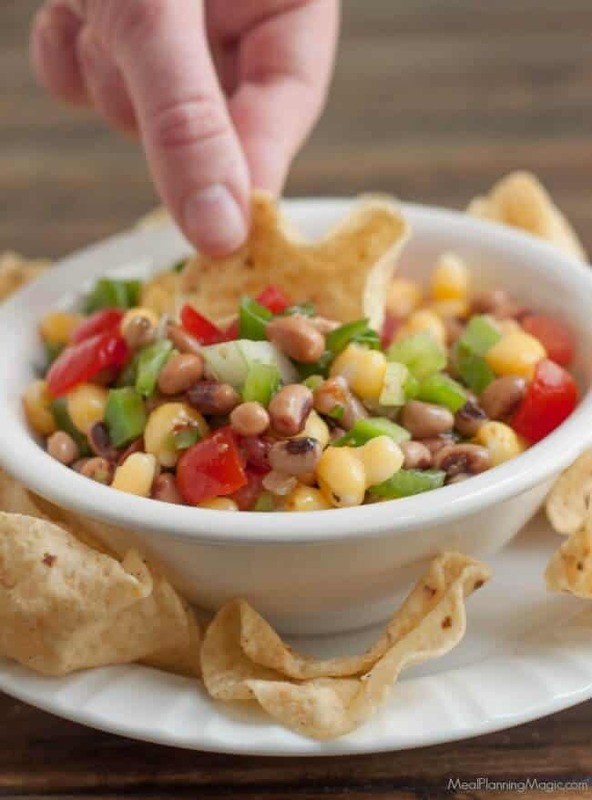 This Healthy Texas Caviar Salsa Dip is sure to be a hit at your next get together and won’t last long. Give it a try today! 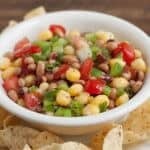 You'll love how easy this Healthy Texas Caviar Salsa Dip comes together and the bonus is that it is good for you and so delicious too! In a large bowl, combine all ingredients and stir to mix well. Refrigerate at least one hour before serving so flavors can blend. Serve with tortilla chips or as a side to chicken or fish. Store in refrigerator up to three days. Thanks! I hope you give it a try soon!